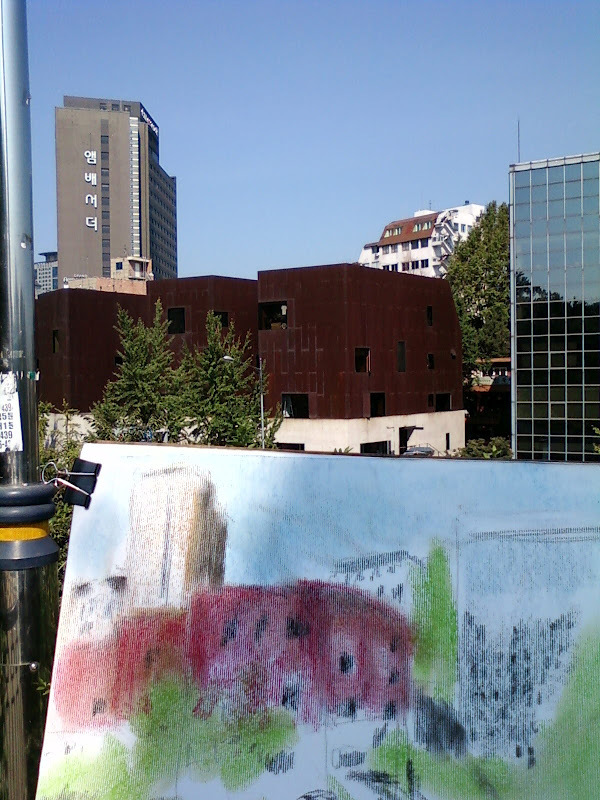 Rusty colored red buildings in a row across the Donguk university was very inpressive. Those buildings were just amazing by contrast of light and shadow with the depth of color. 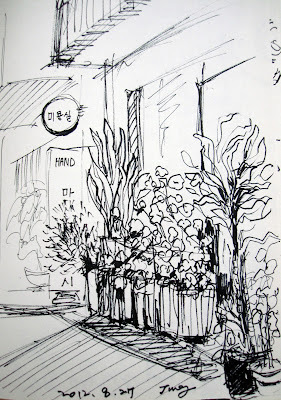 I feel like going there again for more drawings. 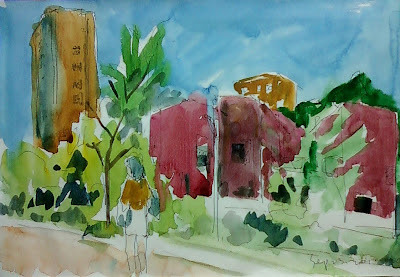 The day was wonderful with autumn weather. 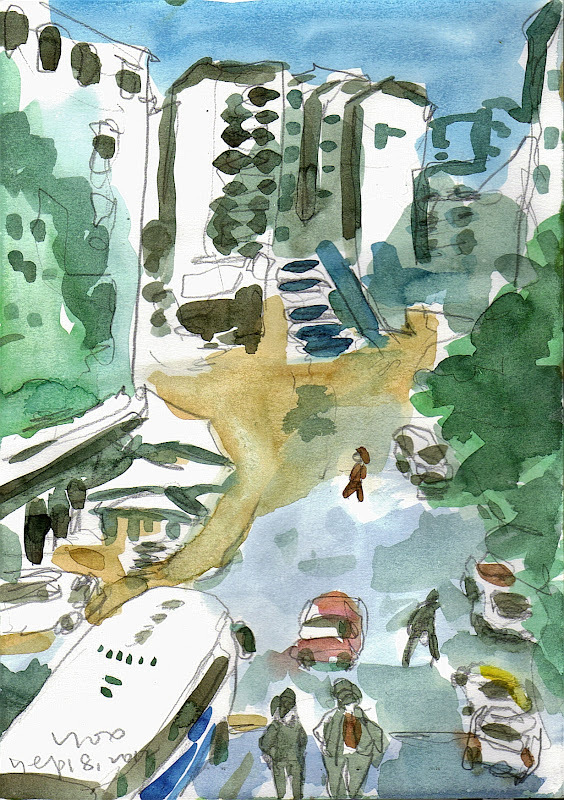 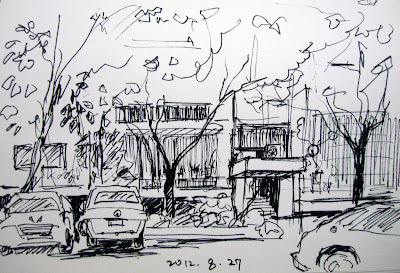 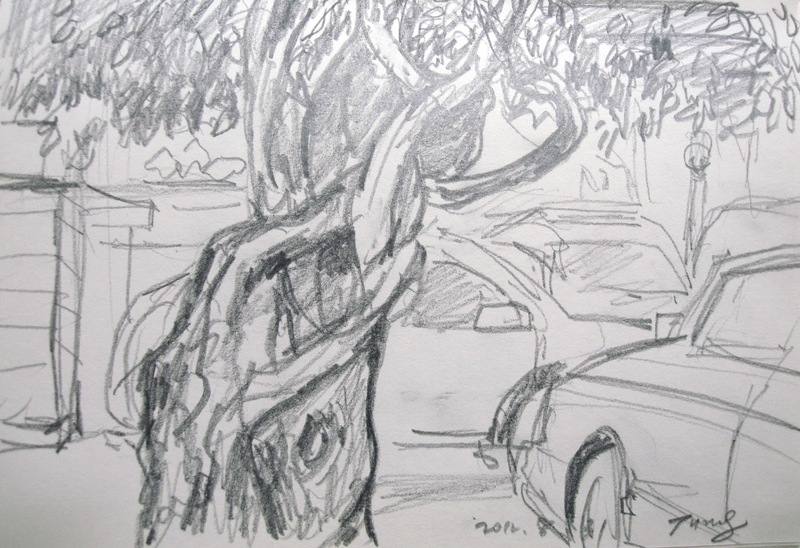 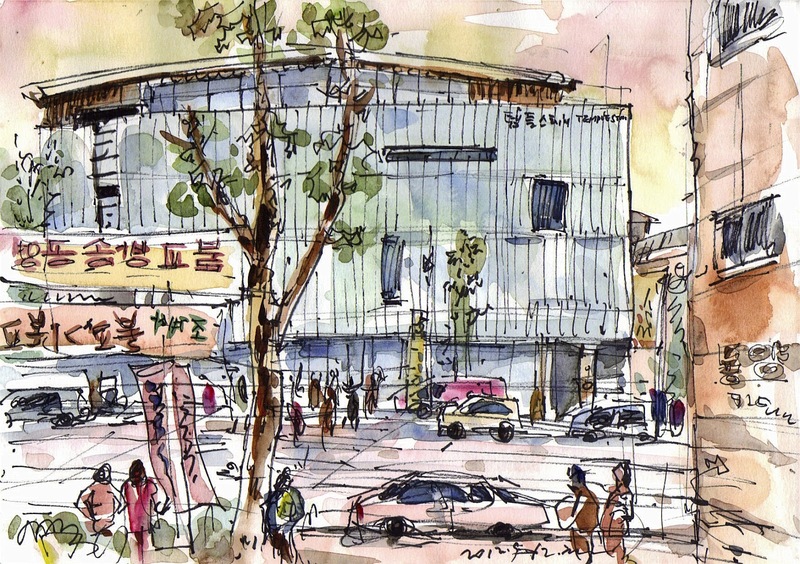 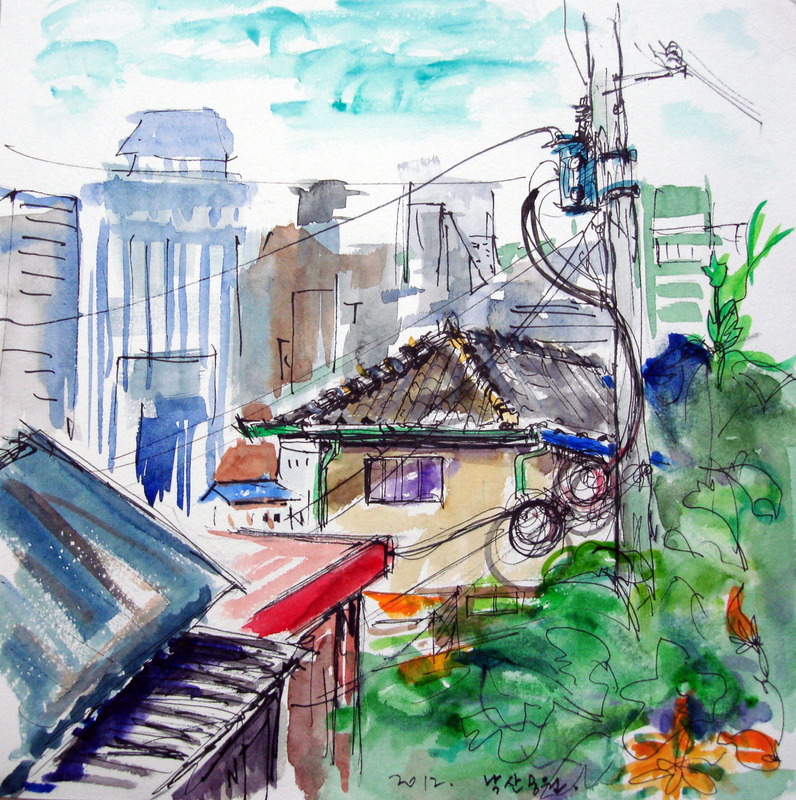 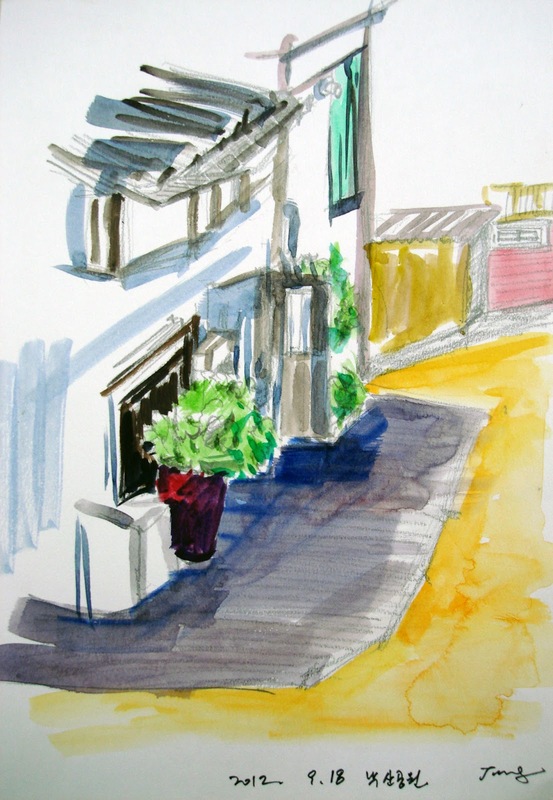 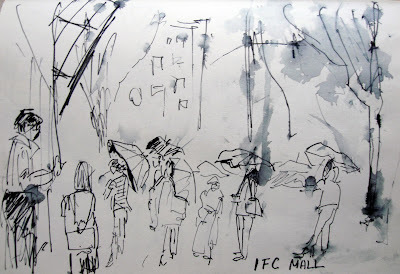 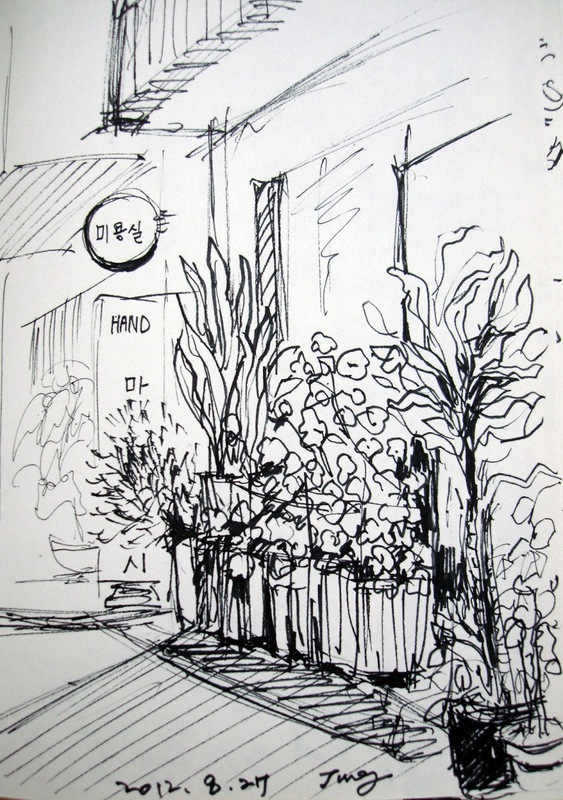 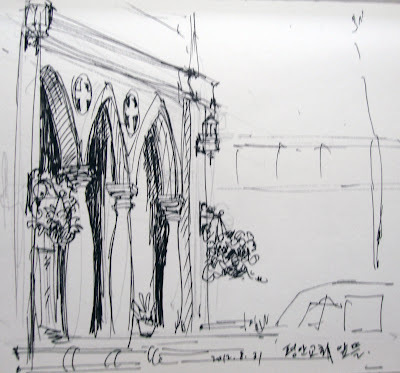 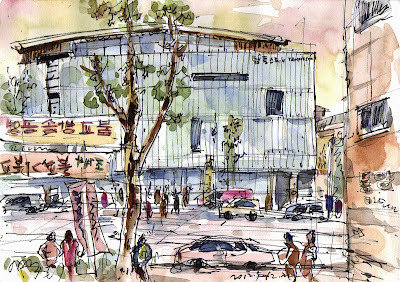 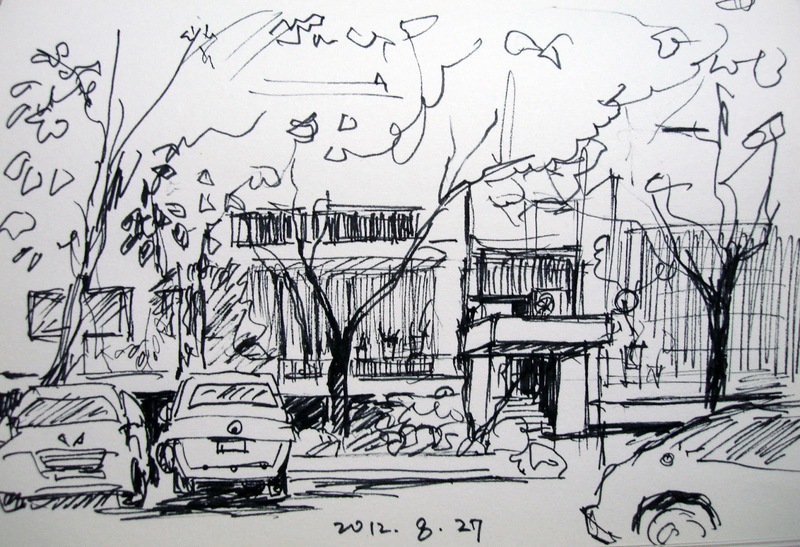 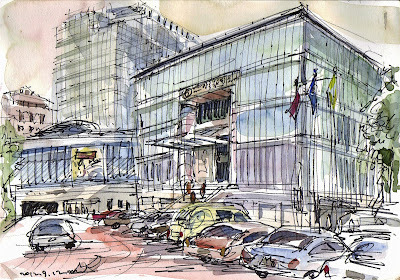 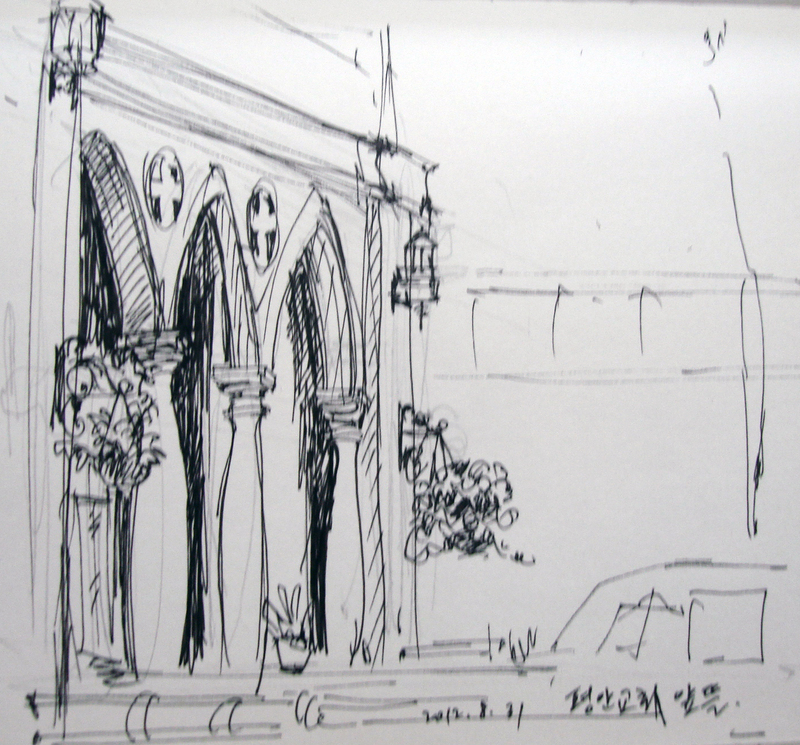 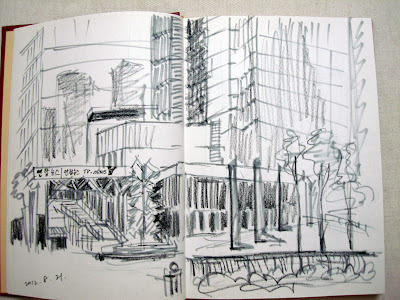 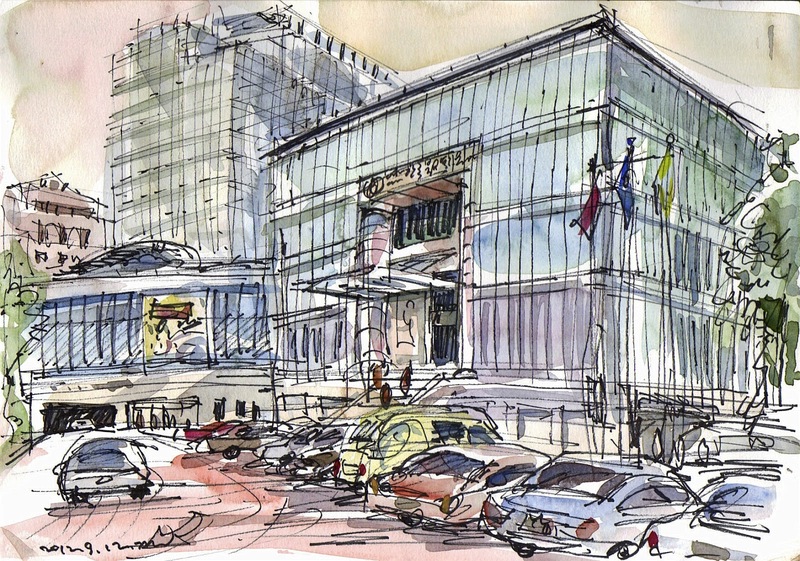 I enjoyed sketching at Dongguk Universityj. The campus was beautiful with young students here and there. And the scenery surrounded by urban buildings was fantastic too. apartments are seen through the campus buildings. 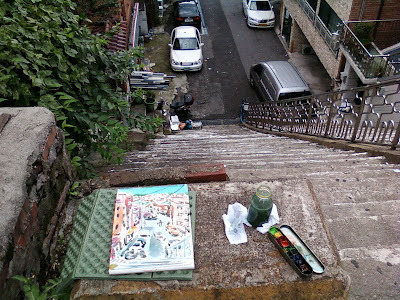 How steep the slope was! 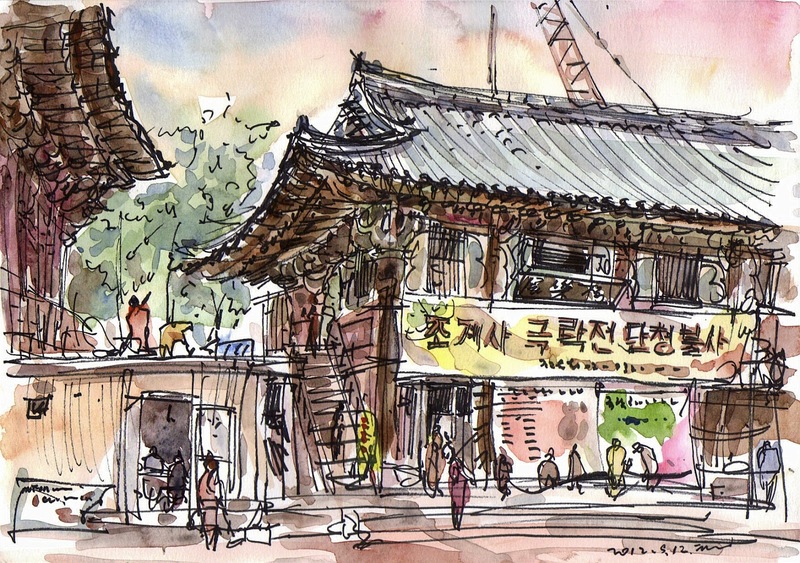 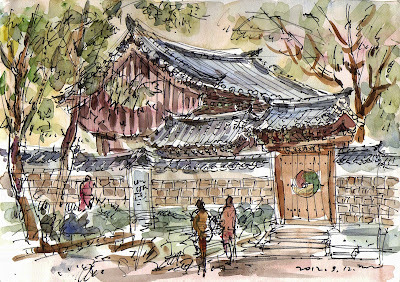 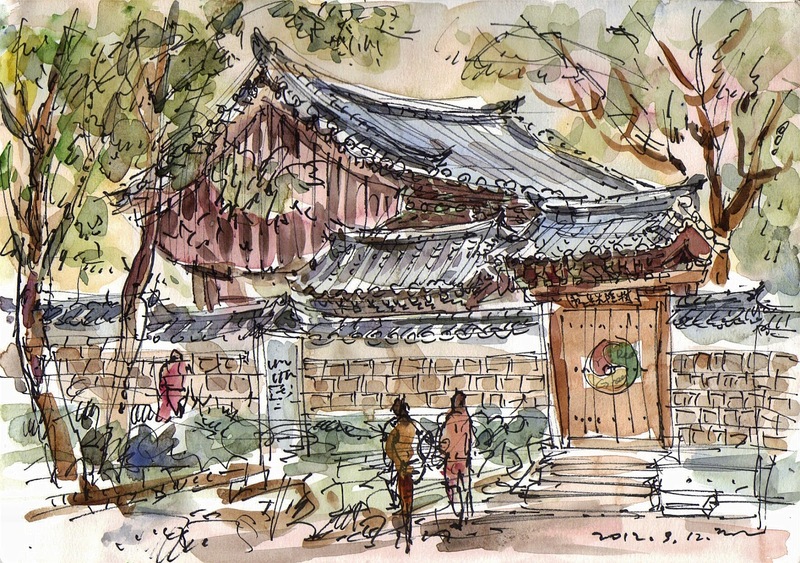 I went to Hansung University located at Samseongyo for sketching. 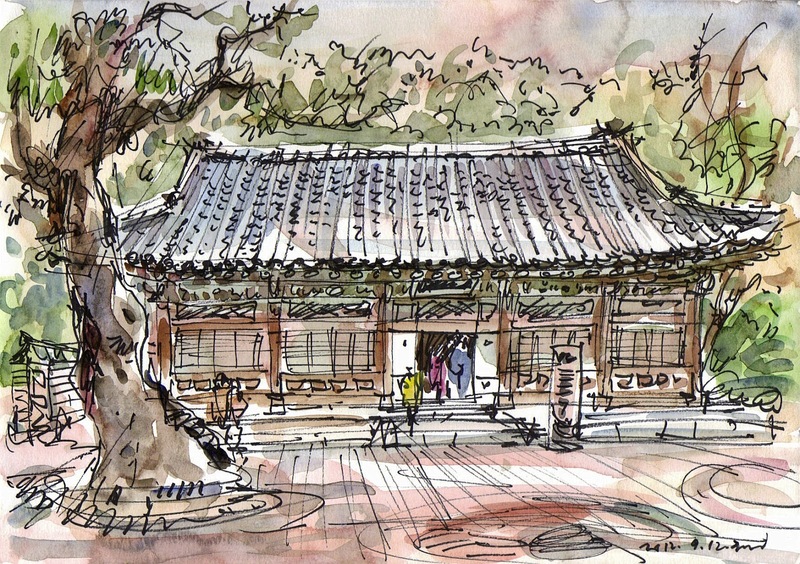 Walking down the Samseongyo - Gil, I could see the very steep steps. But the far scenery was beautiful with houses on hillsides. 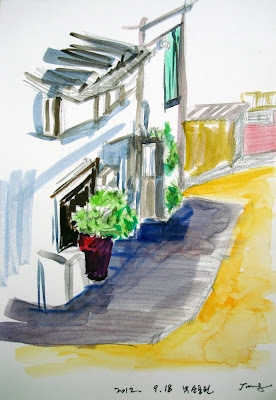 Houses where people live look familiar always. 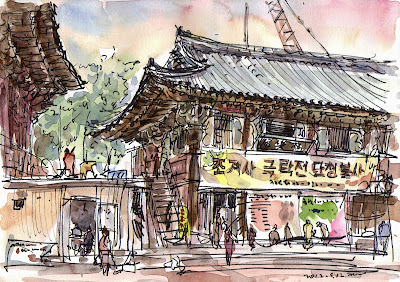 A few days ago, I visited Jogyesa Temple located in the middle of Seoul. 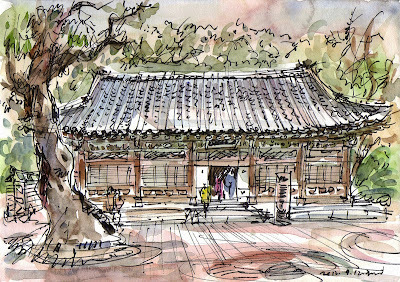 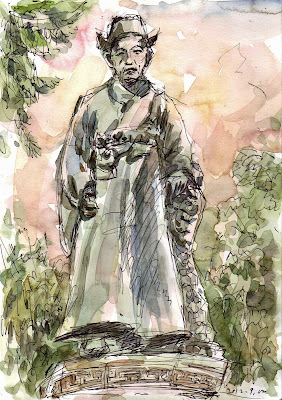 Jogyesa does not give off the solemn and traditional air of the other temples located deep in the mountains. 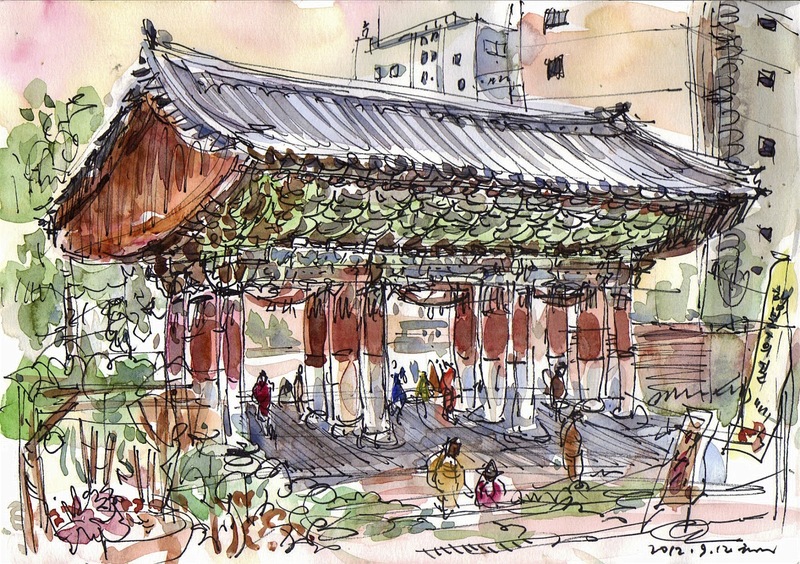 But because it is located within the heart of the city, the public transportation is so convenient, and well combined with the sceneries of the old city Seoul. Maybe another interesting place in town where nature is present is a temple. 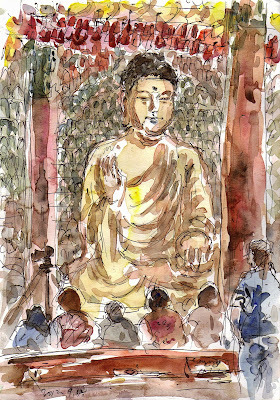 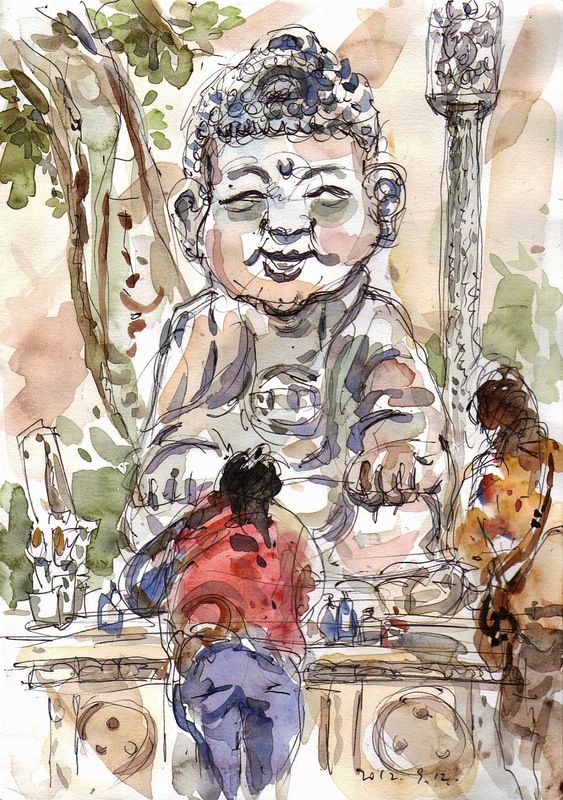 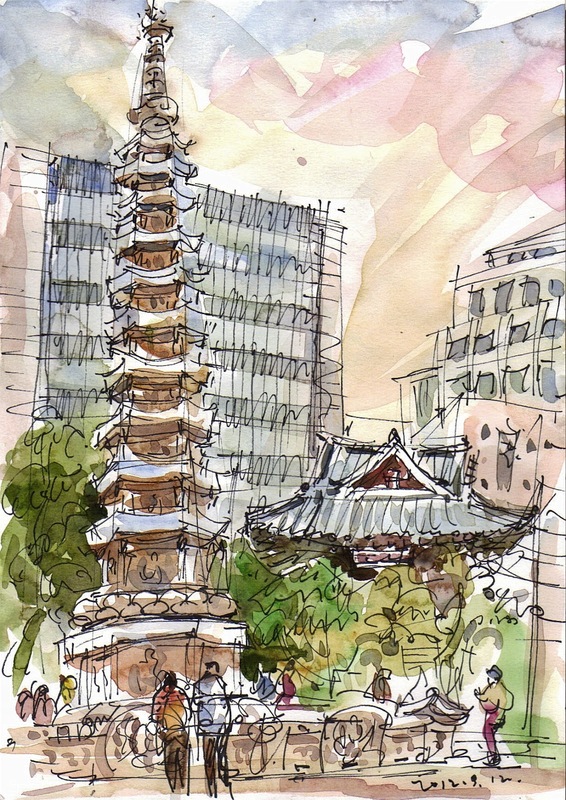 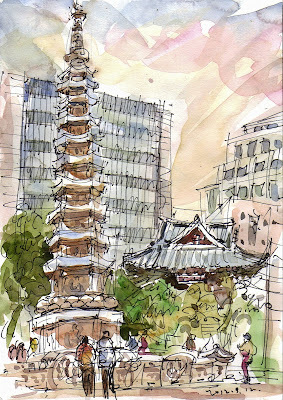 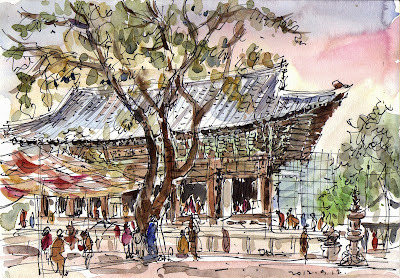 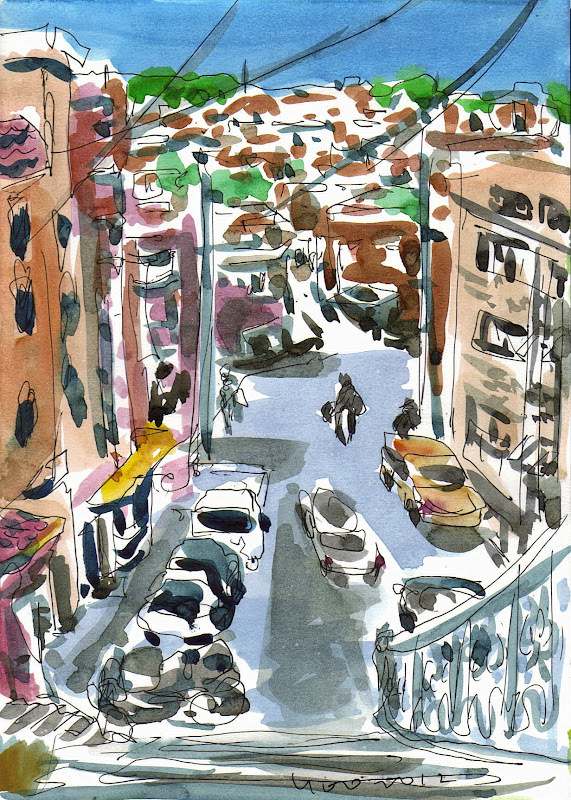 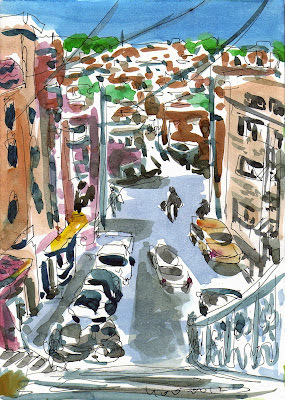 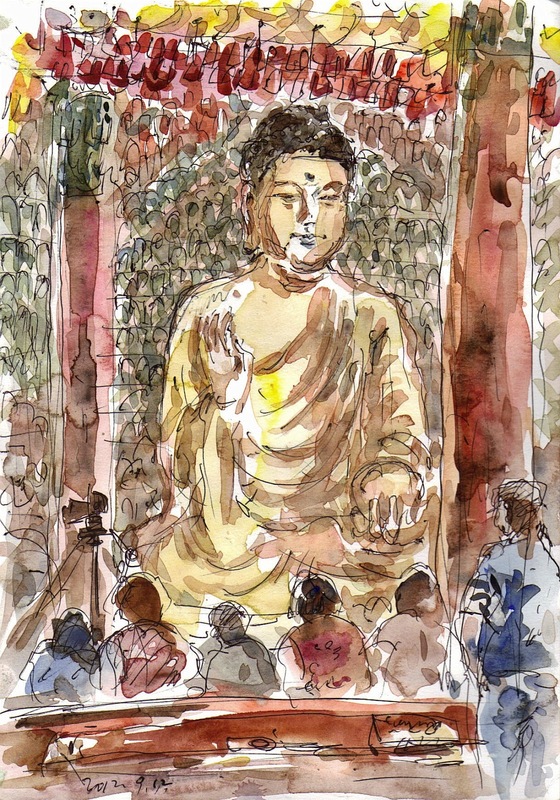 I sketched some colorful sceneries here and there delightfully around crowded precints of the temple. I got to revisit the Olympic Park, near Jamsil, near the southeastern part of the city. I had visited this before, once with friends, the other time to go to a Hyundai-sponsored Summer Concert. 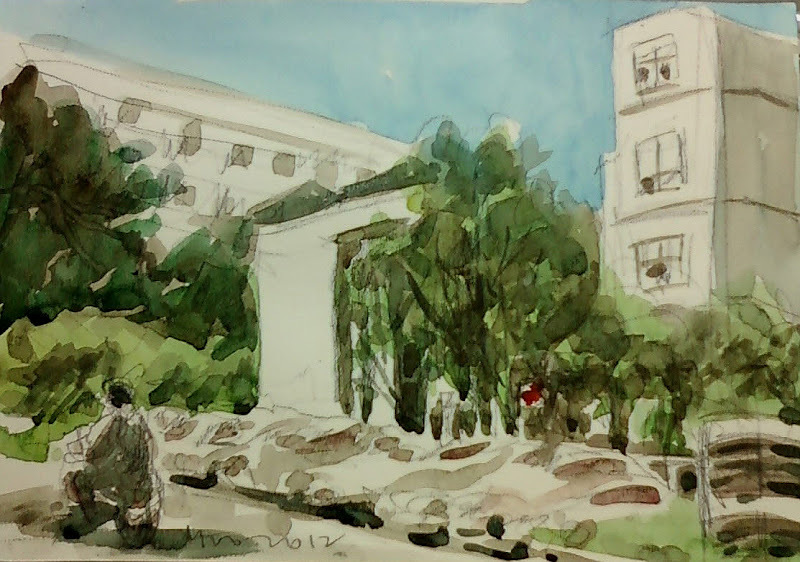 The park was beautiful, with lots of amenities, ranging from rollerblading area and an ice-skating rink during the winter, to a public garden full of interesting sculptures, and an art museum, SOMA, to go with it. 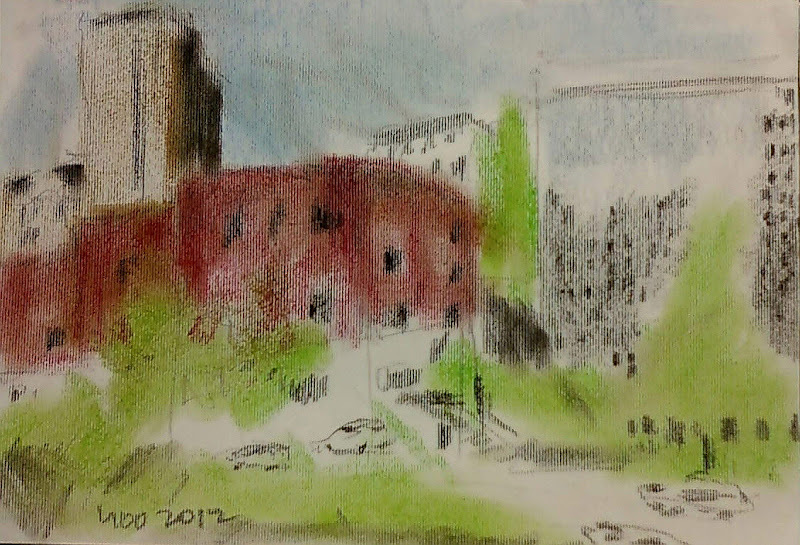 This was my third visit, and it didn't fail to impress me with a mix of historical areas, interspersed with sports facilities. 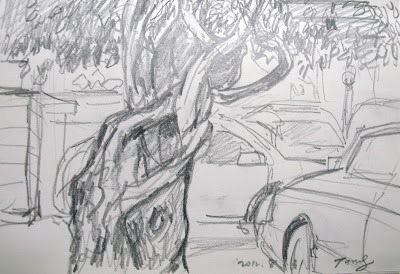 grampas -- The first sketch was done near the entrance. 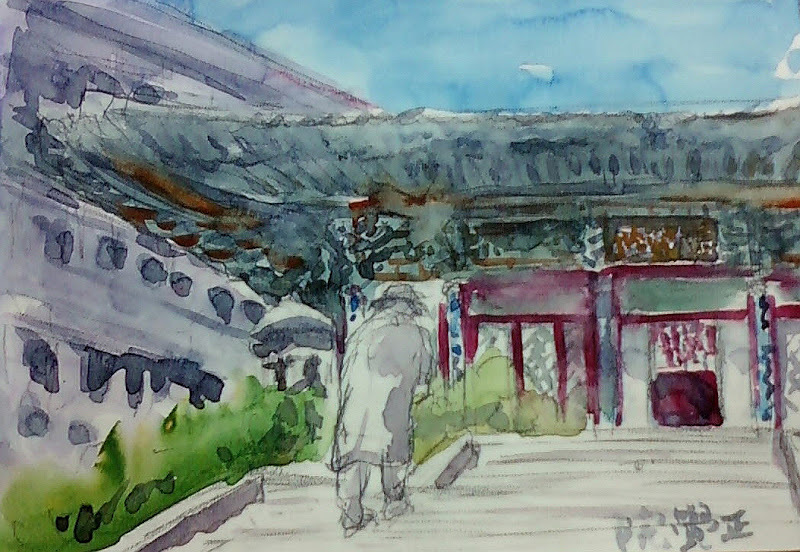 There were many areas with shades, and elderly grampas, joined together for a serious game of Chinese chess or just chit chat. 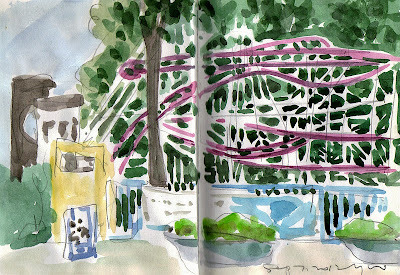 There was even a garden of lavender behind, so it felt peaceful, to be sitting and sketching there. 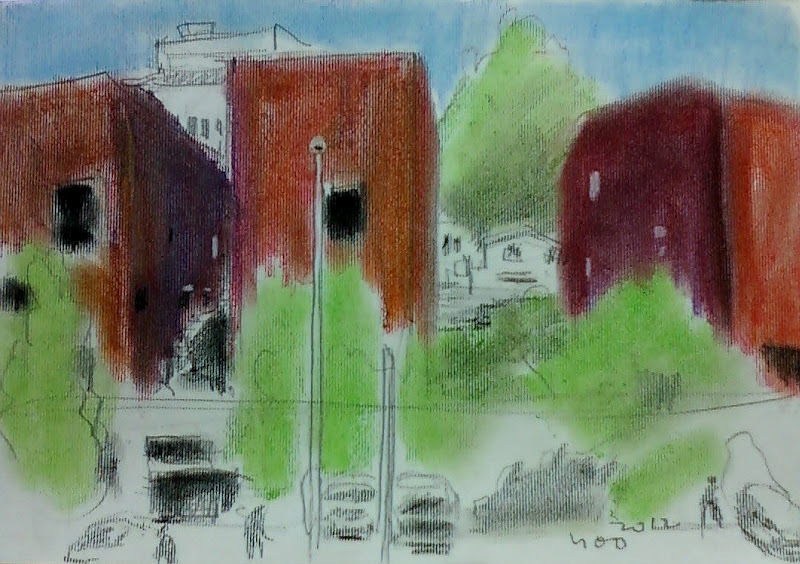 streetview -- This alleyway is the narrow corridor between two parts of the SOMA museum buildings. 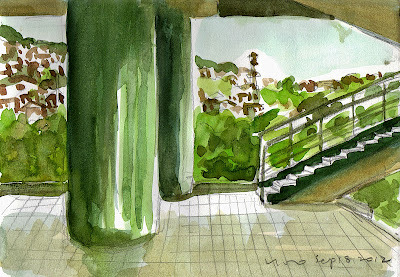 Perhaps because of the long ramp leading up to it, or because of the narrowness of the corridor, it was a stark contrast to the open expanses of greenery both in front and behind, it felt very quaint and mysterious. I stood there for a longer time than usual, trying to capture that mystic mood. 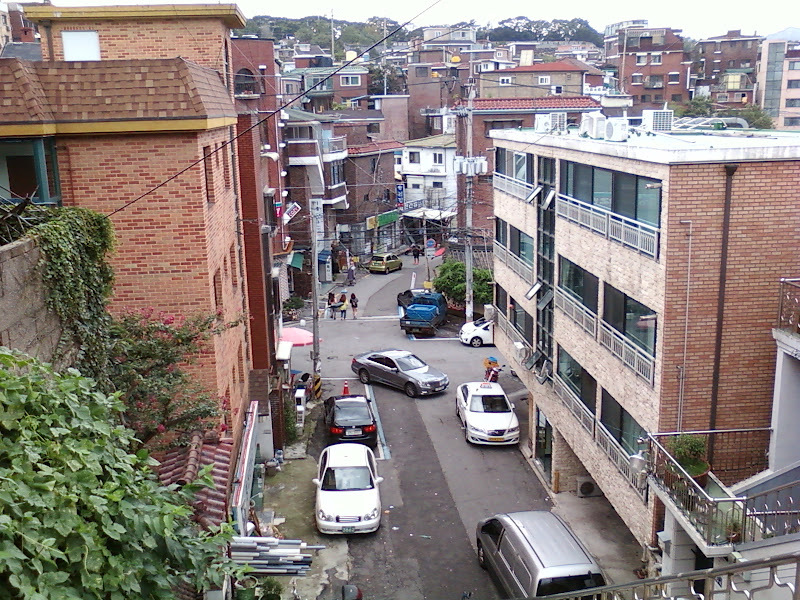 The park locates at Neungdong, Seoul. 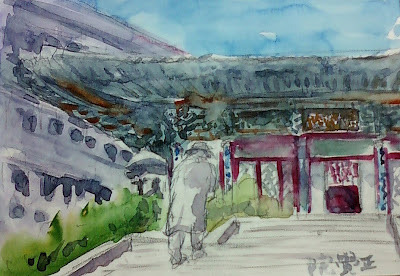 Because the park is free for citizens there are lots of people who walk or come for picnic with family to see animal and enjoy at amusement park too. 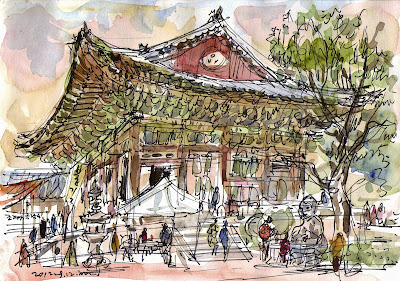 But the amusement park was closed since July 1st this year for changing new riding machines till March next year. 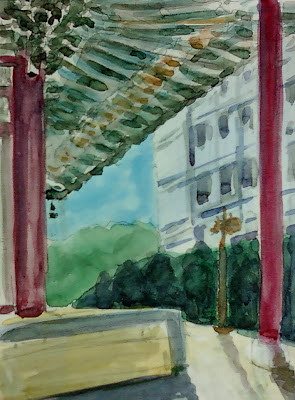 This one locates by the way of rear entrance. 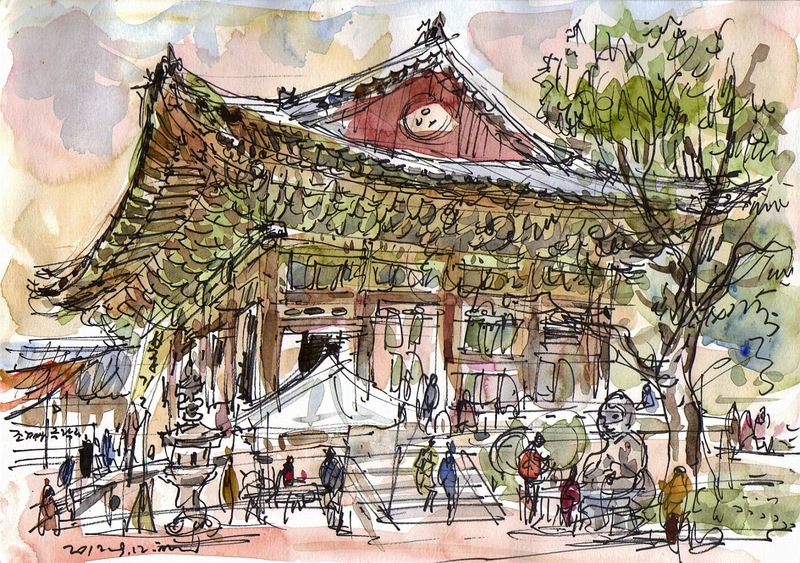 So I could draw though the amusement park was prohibited to enter.